Let’s go diving! Wait, what equipment do I need? Diving is an equipment intensive sport, same as sailing or skiing. You need certain things in order to be able to go scuba diving. Luckily you will find that at most dive shops you will be able to rent the necessary dive equipment. The easy ones are masks and fins. A lot of people do have their own mask. 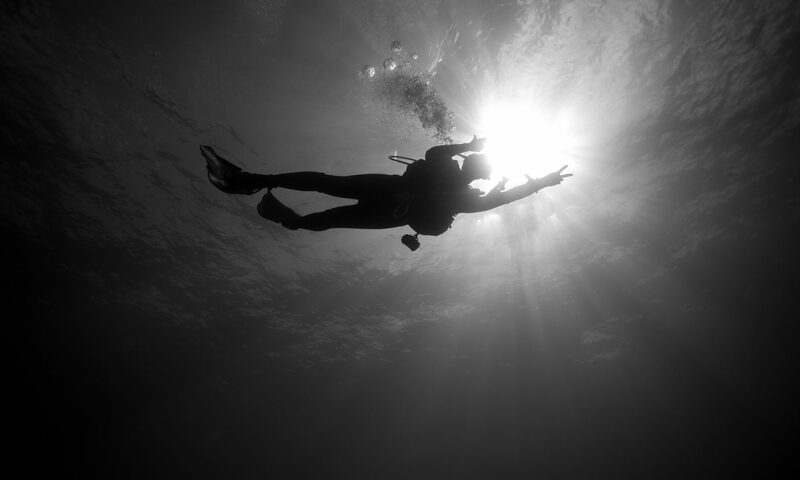 A mask can make or break any dive so it is quit important to find that perfect fit. Sadly more than anything, when it comes to masks, it doesn’t matter how pretty or cool it is. If it is not the right fit for your face it will not seal. You can even get prescriptive masks so you can see just as well below the surface as on top. Of course, don’t forget to buy an awesome mask strap to go on your mask and never get your hair tangled in the strap again! Now we made sure you can see, it is time to have a look at fins so you can move around under the water. There are 2 main styles of fins. Full foot fins and open heel fins. The main difference is that with full foot fins you are all good to go as is. Open heel fins really require you to also have dive boots. The advantage of the open heel fins with boots is that they do keep you warmer. If you are doing shore dives then they are especially nice as you are not walking barefooted into the water. Once you have those items, another easy to bring along on your dive vacation item is a dive computer. Dive computers range from about $200 to over $1500. Of course the more expensive, the more features they will have. The question to ask is do you really need a color screen or GPS tracking? The biggest decision is probably whether you want a wrist computer or a console. Having a computer on your wrist is nice, especially if you are a dive professional as it is right there, when you have your hands full with students. A lot of people use their computers in daily life as a watch as well. Having a computer on your console means it is not as easy to forget it and not another item you need to pack. As the quality of dive shops is getting better and better, the next 2 items are probably the last on your list. They are also the most expensive ones. The lifeline of your dive, the item that makes you breath: your regulator. As with any item of your equipment you can go as cheap or as expensive as they come. The more expensive, generally the more options you have. From swivels on your 2nd stage for ease of movement to better breathing. Do keep in mind that you need to be able to get it serviced regularly so you will want to make sure you buy a brand that is easily serviced in your area. Lastly your BCD. There are a couple of things to look at when it comes to BCD’s. The first thing is weight integrated or not. If your BCD is weight integrated, then it means there are pouches in the pockets to put weights in. This is nice so you don’t have to wear a weight belt, making it more comfortable on yourself. Often these BCD’s also have trim pockets on the back making it easier to obtain a better trim. The next choice is whether to have back inflation or normal inflation. Back inflation will give you a better positioning underwater as it pushes you forward. Lastly there is the i3 technology. This means you don’t have an inflator hose, but a button on your side pocket to inflate and deflate the BCD. Now you know what to get have fun shopping!